Retro-Acid is Kozzmozz’ second oldest concept and celebrates the joys that we experience thanks to the famous silver box, the Roland TB-303 bass machine, the machine that made such a huge impact on electronic music, and is still a big influence for many artists today. It sure as hell made us dance till the break of dawn and beyond… actually, we’re still losing our minds over these sounds today! 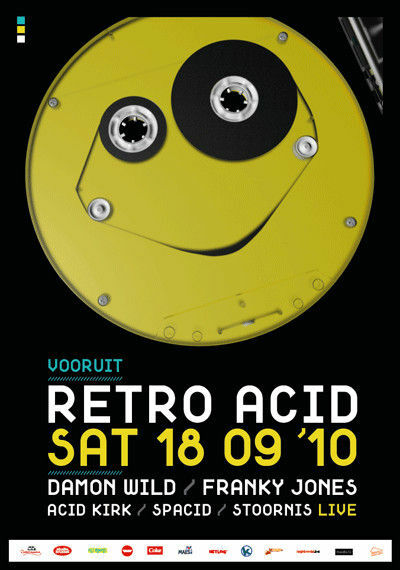 In other words, Retro Acid is thé party for any 303 fan and its unmistakable old-skool Acid sound. This edition will be a hard one, so leave your moccasins at home! A top notch selection of artists who have been at the forefront of the international electronic music scene, from the early acid days till now, will treat you to the best acid out there. And since Belgium played an important role in the development of acid we also invited 4 Belgian names who will definitely rock the place… hard. From New York, we welcome Damon Wild who rocked the 303 and gave us acid hits like “Bang the Acid", Afghan Acid" and "Avion”. The man has worked under different monikers including some that are focused on acid. He was also part of the group The Pump Panel, delivering the acid classic “Ego Acid” and made an acid remix of New Order’s “Confusion” and DHS’s monster hit “The House of God”. Franky Jones who made one of the biggest dance records ever with Jones & Stephenson’s “The First Rebirth” in ’92, will bombard our Retro Acid floor with muscled beats and raving acidlines. He was resident in all the leading Belgian clubs as Ravezone and Montini during the 90’s and played at major international events on the planet such as the Love Parade or Mayday. But Franky has been present in various scenes and also regularly played at many underground acid parties such as Techno 94, Acid Attack and foreign clubs like Wharehouse, E-Werk and Tresor where he was a much appreciated guest. And he’s not the only one who possesses a huge acid collection, also Spacid, who was at the forefront of the underground party-scene in the 90’s through his Funky Green Aliens organization, has been pushing the early acid sound in Belgium since the very beginning. As did Acid Kirk, who was one of the pioneers of the Brussels acid scene. He was a member of the underground collective B.W.P. (it stood for “Bad Woofers Posse” and “Brussels Weird Project”). Created in 1989 with other members like D-Jack, Mike DMA and Deg, the collective organized the legendary PK Studio warehouse parties from 1992 till 1994 and produced the famous Strictly Underground Ep Vol. 2 on Bonzai Records. Acid Kirk meanwhile produced acid for various labels such as Diki Records, Dance Opera, Bonzai and Head In The Clouds. For a while he focused on experimental projects under various aliases, but now he’s back on the acid track. Proof of that is his last ep “Out of the Blew”, co-released by First Cask and WéMé, which marked his return on the acid scene. Next to the usual suspects, Retro Acid has always pushed new talent. This time the live act Stoornis, a live project by 4 acid freaks from Ghent who made it their mission to bring back the sound of the revered 303. They started as a small party organization throwing parties in Ghent around 2005 which developed into the now highly attended X-Live parties. They have performed on different small and bigger parties through the Benelux and surprised many with excellent performances at Bangface (UK). So be prepared for a true acid attack !